It seemed everyone who visited my garden in the early years pointed out these shoots growing between the main stem and the side stems of my tomato plants. As a new gardener who soaked in every piece of wisdom I could get, I started pinching off every sucker I could find. After all, I didn’t want that stem to take energy away from the plant and hurt the harvest I looked so forward to. Eventually, though, as the season progressed, I ran out of steam and couldn’t keep up with all the suckers. Yes, my plants grew a little unruly, but the juicy red tomatoes didn’t seem to notice. Over the following years I took a haphazard approach to pruning the suckers off my tomato plants. If I saw them and thought about it, I’d pinch them off. If I missed a few, no big deal. Then, the more I listened to gardening experts, the more I noticed that not all growers shared the same opinion when it came to pruning suckers. 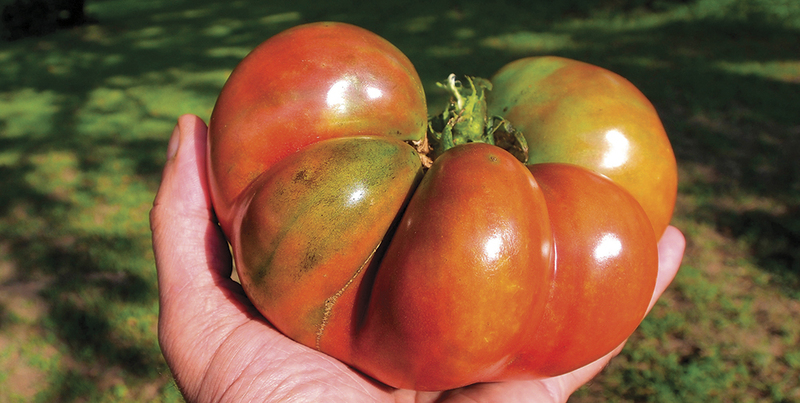 Mike McGrath of the You Bet Your Garden radio show; Joe Lamp’l of the PBS show, Growing a Greener World; and Craig LeHoullier, the pioneer of the Cherokee Purple tomato and author of Epic Tomatoes, all have expressed skepticism about this common practice. To prune or not to prune? That was the question. Last season I put it to the test, deciding to neither rely on common practice nor experts’ advice. Instead, I ran an experiment in my own garden. I planted two equal rows of tomatoes, comprised of Amish Paste, Arkansas Traveler, and Black Krim, side by side. In one row, I methodically and vigorously pruned every sucker I could find. In the second row, I removed none of the them. The results? The experts proved correct. The row of single-stem unpruned tomatoes produced 37% more pounds of tomatoes per plant than the pruned row. And, contrary to a common belief, the pruned row did not produce larger tomatoes. To be fair, even the experts believe there is a place for pruning suckers, but it isn’t because pruning will produce more or larger tomatoes. Instead, pruning can help keep the large, vining tomato plants tidy and in check. This might prove especially needed in certain situations, such as gardeners growing tomatoes in small spaces. But less foliage also means less shade for the developing fruit. In my row of pruned tomato plants, the fruit suffered more sunscald than in my unpruned row. They also succumbed more rapidly to disease than the plants with more foliage. Don’t do something just because it’s what you’ve always done. Or because it’s what your grandfather did. Or even because a garden expert weighs in. Instead, take the wisdom gleaned from all of these sources and test it in your garden. See what works best for you. Perhaps you’ll decide to strike a balance of light pruning instead of an “all-or-nothing” approach. You’ll never know what truly works best in your garden until you test different ideas. Some of the most fun in the garden can be had when we do these experiments and observe the results! Test something in your garden this year. As far as I’m concerned, the only “sucker” is the one who never tries different approaches and who never tests something new.